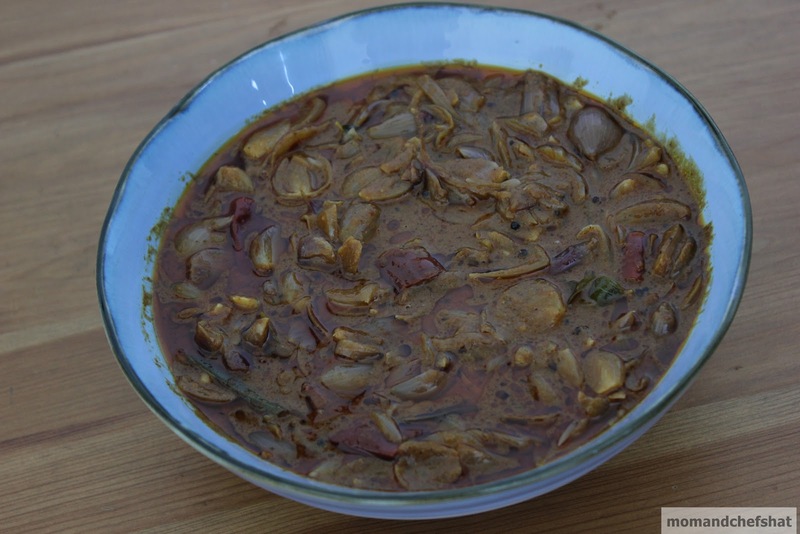 Green chillies, chopped - 4 Nos. Cut bittergourd into small pieces. Marinate bittergourd with turmeric powder and salt. Fry them. 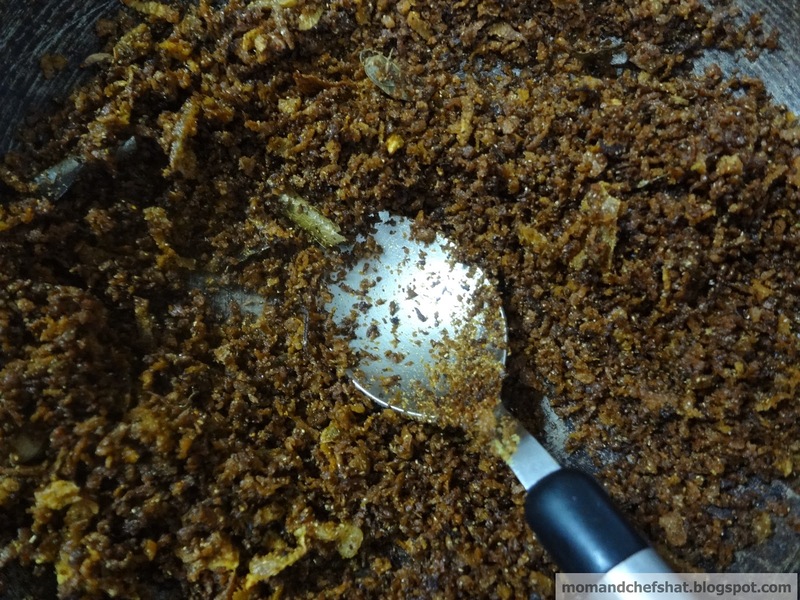 Grind grated coconut and cumin seeds. Crush the mustard seeds and add to it. Heat oil in a pan, splutter mustard seeds. 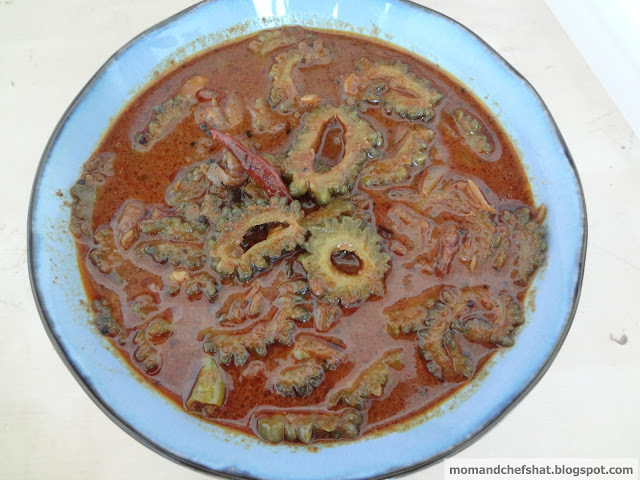 Add dry red chillies, onion, green chillies, ginger, and curry leaves. Saute them. when the color starts to become transparent, add the ground paste to it. When it starts to boil, add fried bittergourd. Switch off the stove. Add yogurt (whisked) and salt. Consistency should not be too thick or thin. Note:- Onion is optional, but again the sweet taste of onion complements the bitterness in a good way. Grate beetroot and keep it aside. Heat oil in a pan, allow mustard seeds to crackle. Add dry red chillies. Now add ginger, green chillies, and curry leaves. Saute for 1 minute. Add chopped onions and saute them well. When it turns translucent, add beetroot and cook them well. 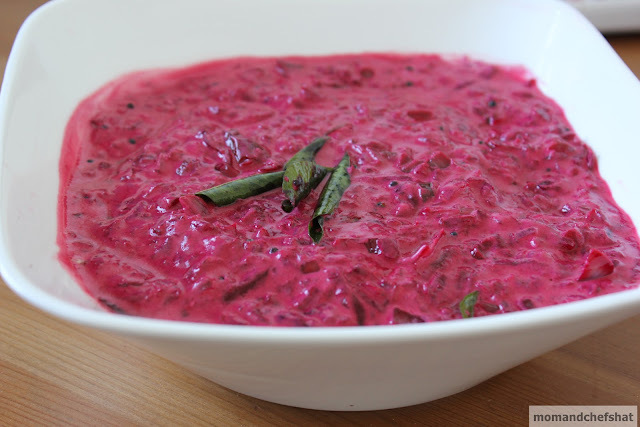 Add yogurt to this along with some water. 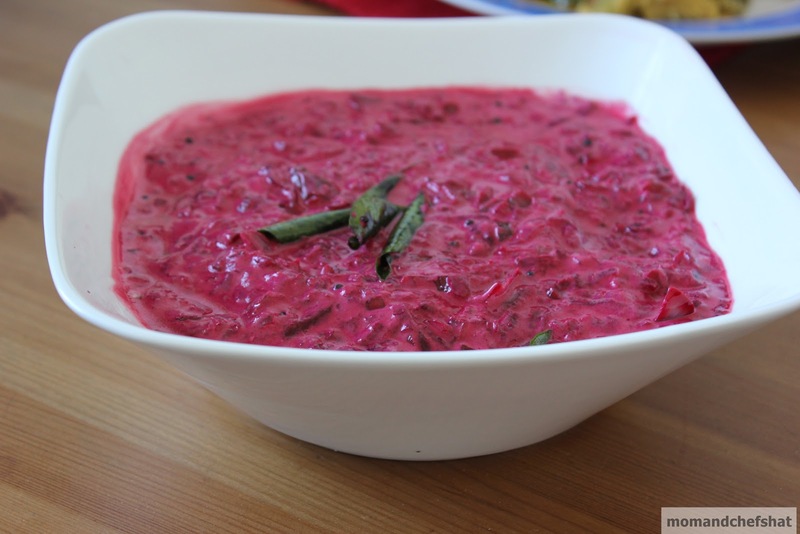 Allow heat to pass through the yogurt. Don't boil it. Switch off the stove. 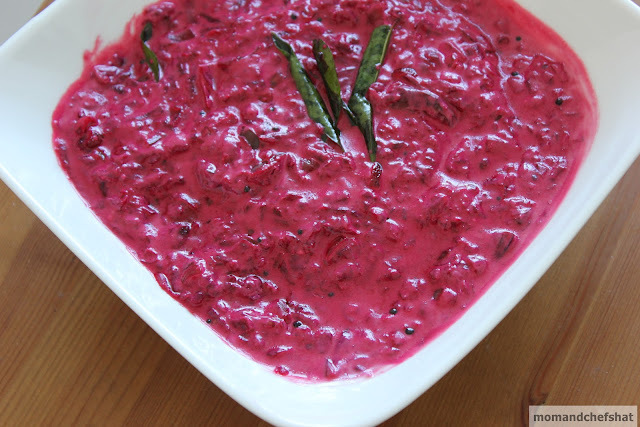 Beetroot Kichadi is usually served as a Sadhya accompaniment. Cut bittergourd in thin rounds removing the seeds. 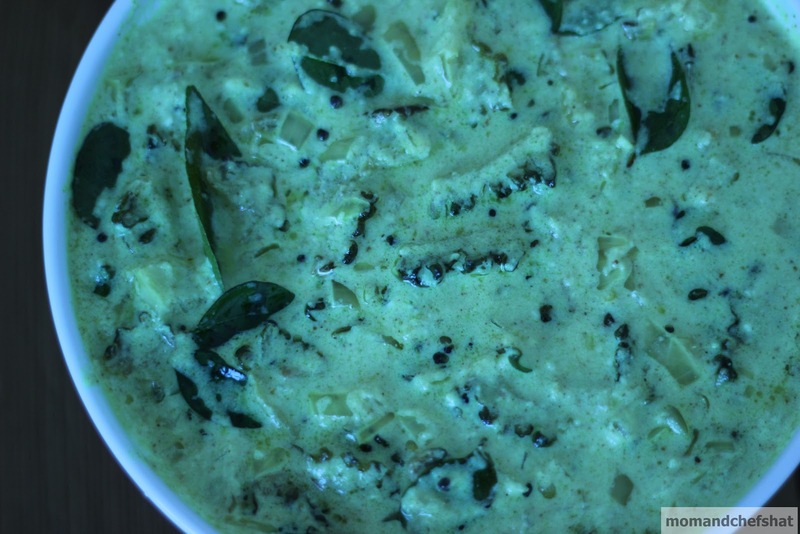 Heat 2 tsp oil in a pan, add grated coconut, garlic, pearl onions, curry leaves, and cumin seeds. Roast them till they become brown in color (don't burn them). Add coriander pdr, chilli pdr, and turmeric pdr. Switch off the stove immediately and stir them continuously (so that it doesn't burn). When it is cold, grind them. Keep the ground mixture aside. Heat oil in a pan, crackle mustard seeds. Add dry red chillies and curry leaves. Pour this over the above prepared curry. Note:- If the bittergourd turns out too bitter, Sprinkle some salt above the bittergourd and let it sit for 10 minutes. After 10 minutes, rub it well and remove the water. This is to take away some bitterness. I am super excited as our friends are coming for Onasadhya. Vegetable shopping is done. Some cleaning to be done in and around the house. Tomorrow is going to be a busy day. Before busy-ness catches me, I want to relax a bit and enjoy a wee bit of time with Abbey. My girlie has gone to sleep early as her mom was very busy and didn't give much needed attention, which she asked for. This Manga curry can be prepared ahead and refrigerated. Cut mangoes into small cubes. 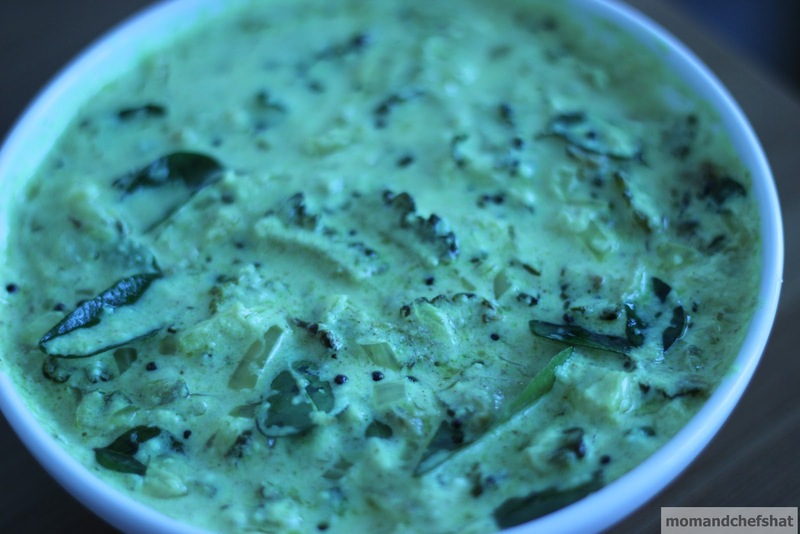 Now add salt, chilli powder, and asafoetida to the cut mangoes and mix well. At last, season with mustard seeds and fenugreek powder. Onam Mango curry can be made ahead and refrigerated. 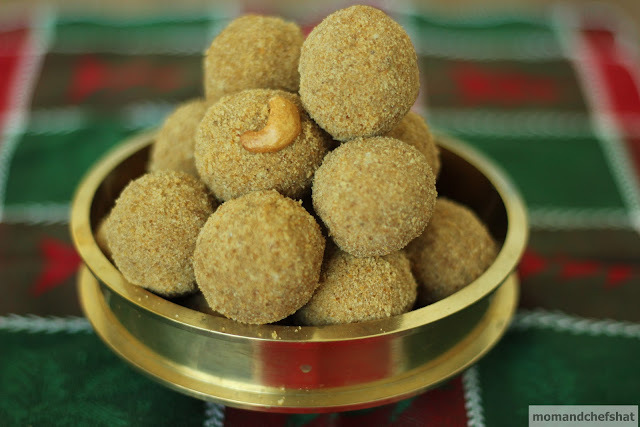 We never used to make kurukku kalan for onasadhya. 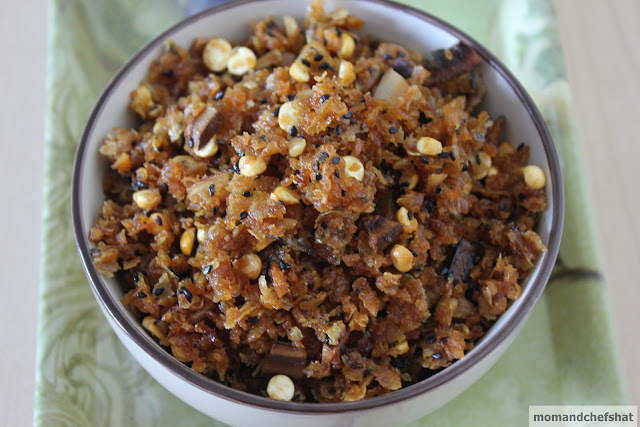 Pineapple pulissery used to replace kalan at our home. Things have never been the same once I got addicted to kalan. 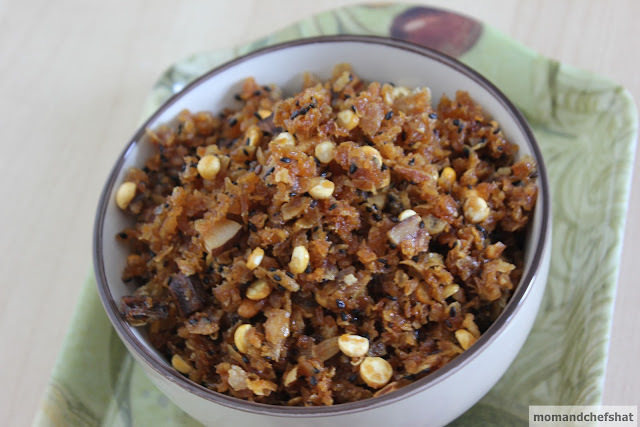 I wanted it so badly for one Onam that my husband searched and found a shop which sold those opaque bottles. I was one happy girl to receive what I wished for. The happiness was short lived as I opened the kalan jar whew! it was spoiled. I am quite happy to have learned it myself over the years and don't have to depend on store bought ones. 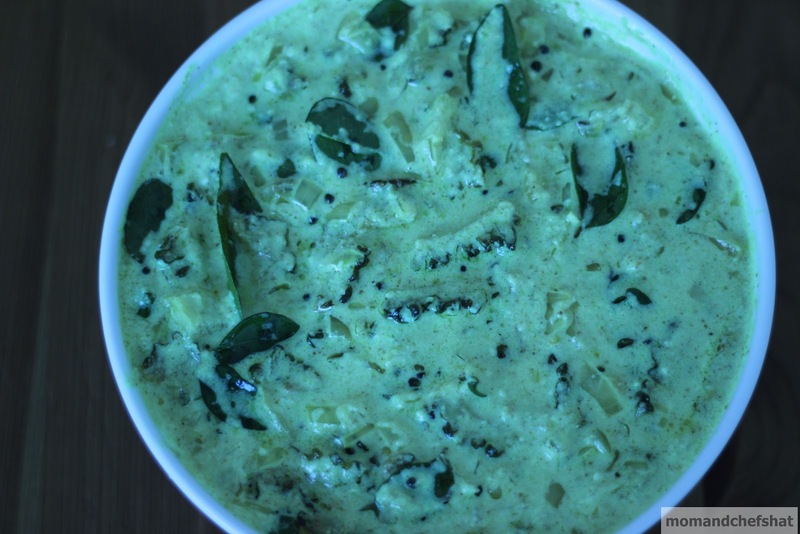 This recipe is for all Kurukku kalan lovers out there. It is a little bit time consuming process, but definitely worth the wait. 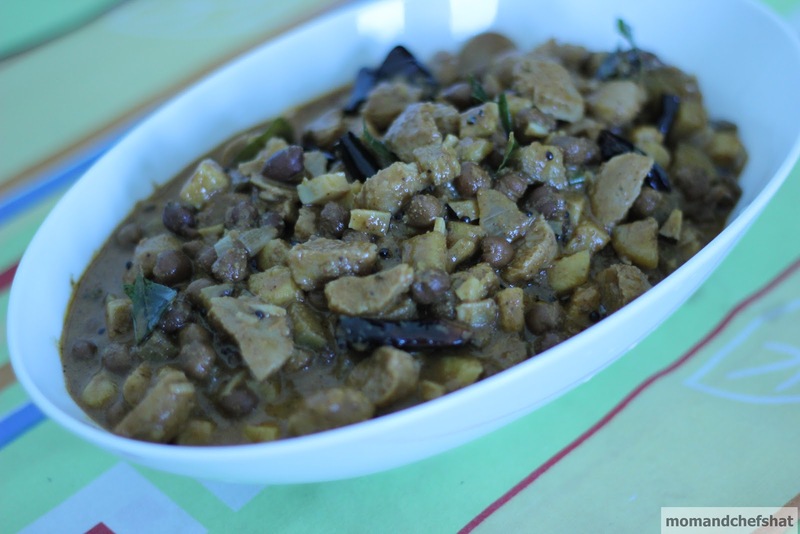 It is one curry that can be made ahead just like Inji puli. 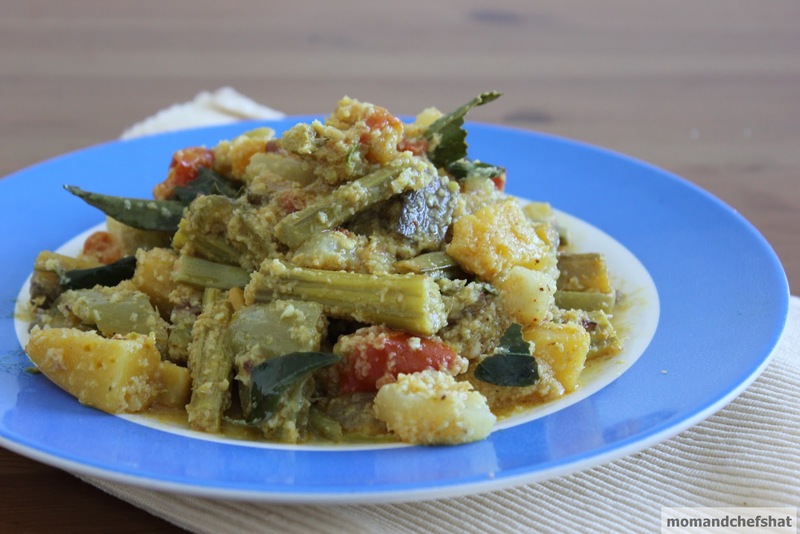 Cook plantain and yam in little water along with turmeric powder and pepper powder. Once done, add ghee and saute well. Now add yogurt to this and let it boil and then reduce it nicely till it thickens. When it thickens, add the ground ingredients (from to grind section) and cook for a minute. Add fenugreek powder at this stage. Heat oil in a pan, add mustard seeds, dry red chillies, and curry leaves. 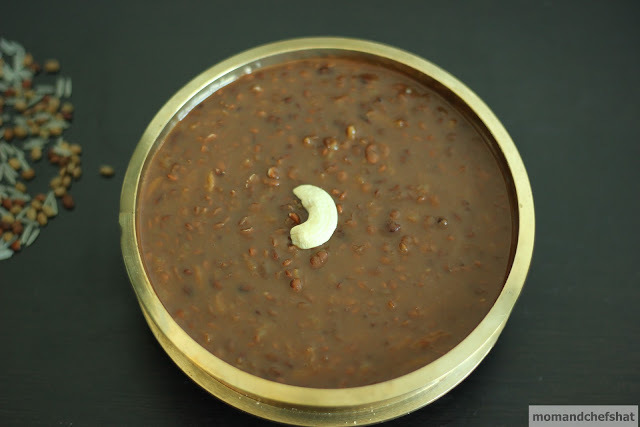 Pour this over the prepared Katti Kalan and enjoy. Soak black chana/kadala overnight. 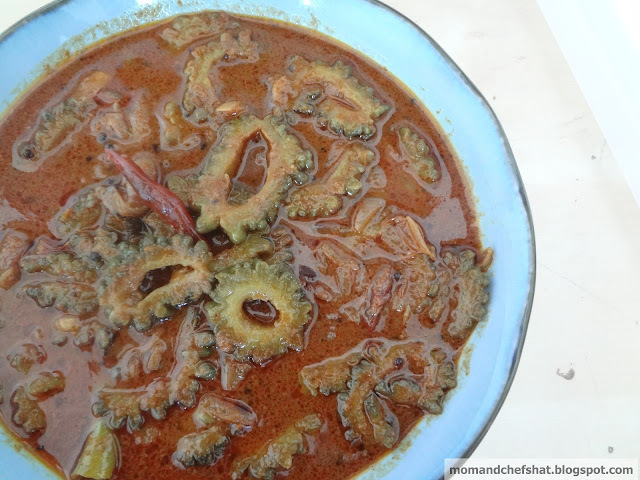 Pressure cook kadala till it is done with little salt and a pinch of turmeric. Keep cooked kadala aside. Pressure cook yam and plantain till one whistle. Now pour the cooked kadala on top of the cooked yam and plantain. 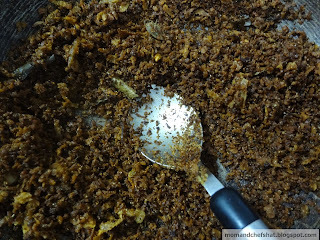 Now add coarsely ground items to this (check to grind section), jaggery and cook for sometime or till water is absorbed. Now season it with above roasted ingredients from (to roast section). Adjust salt according to your taste levels. I am not an Ashgourd lover. 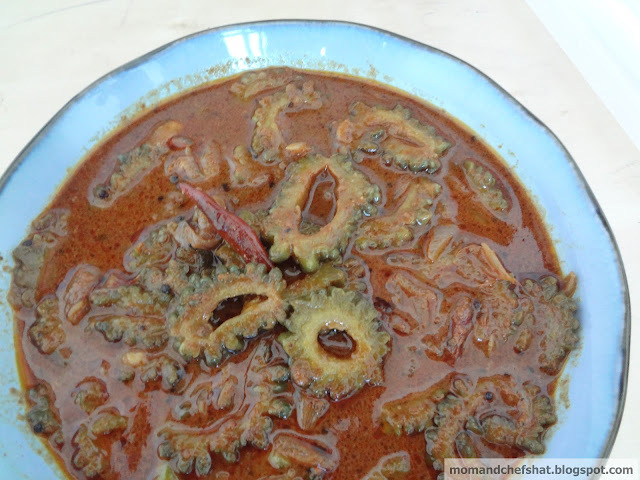 Haven't cooked with ashgourd for years, simply put this way, we don't buy it. Recently my Mom handed me this recipe. 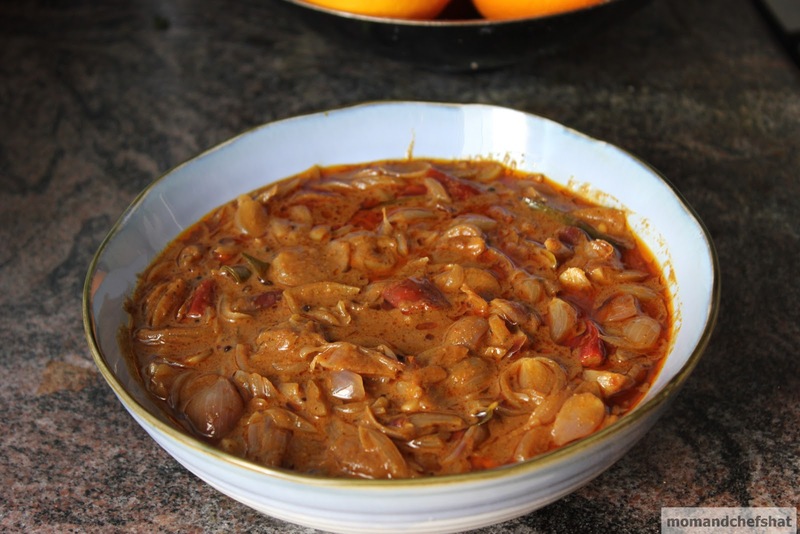 When I found it was such an effortless curry to make as well as delicious have been making it since without fail. 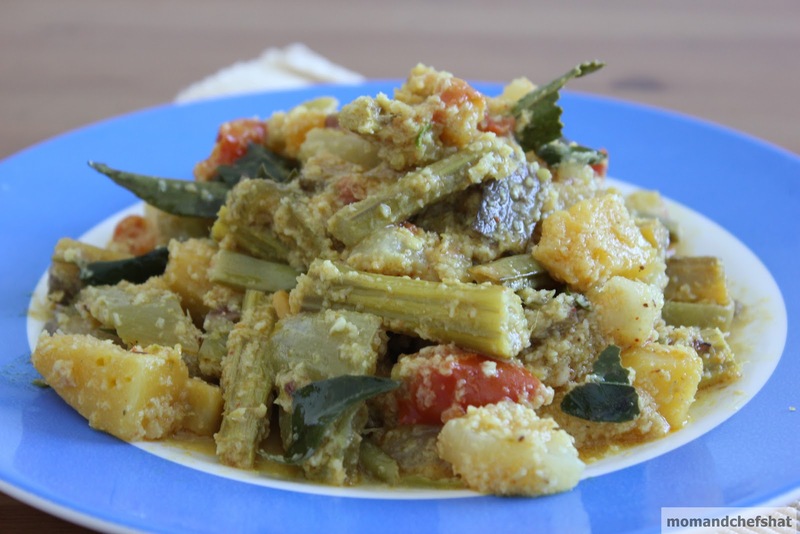 It has a subtle sweet texture of its own and goes so well with masala laden curries. Oh! coconut cream in tins make it really easy. Thanks to Eastern coconut cream. Previously I have used many coconut milk tins without success. Cut ashgourd and pumpkin into cubes. 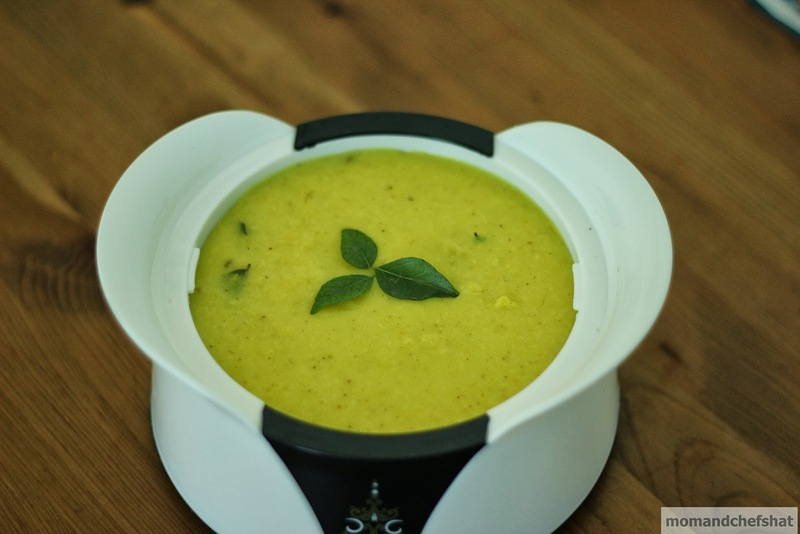 Cook ashgourd, pumpkin, and green chillies along with water till it is done. Pour coconut cream or coconut milk according to your consistency. Once the coconut cream/milk gets heat up, immediately switch off the stove. 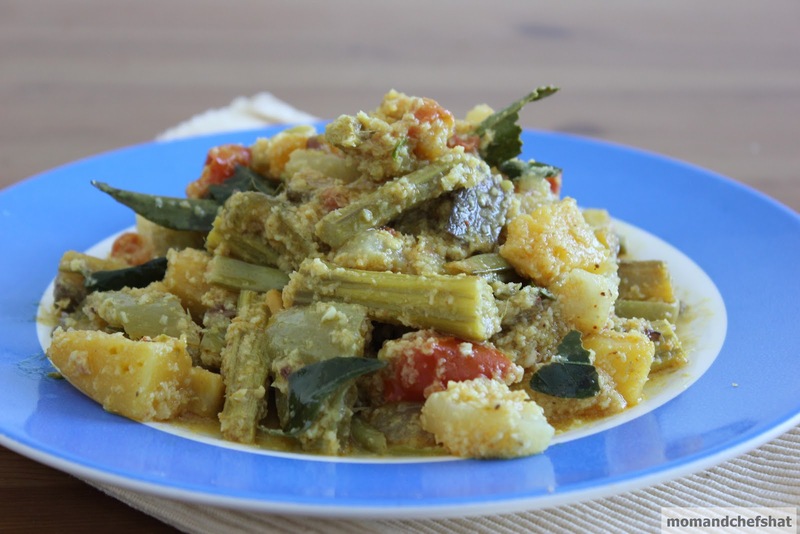 Pour some coconut oil and curry leaves on top of the curry. There is nothing to beat the smell of roasting coconut wafting through air in the kitchen. It reminds me of the Mom's busy Onam kitchen where she used to put an elaborate meal for all of us single-handedly with such ease. Hats off Mom. She used to make us fantastic meals all throughout the year without any complaints. I have never heard her whining about the hard work she puts in. Of course, Mom's food always turned out to be a huge hit among friends and family. I have learned from her if you cook someone something with love and ease, it stands out in the crowd. Soak vanpayar overnight. Cook vanpayar in a pressure cooker till it is half done. Now add pumpkin to the above and cook till one whistle. Open the pressure cooker, add the ground items given in the (for grinding) section. Cook for five minutes or till it thickens or water reduces completely. Now add the roasted materials from (for roasting) section. 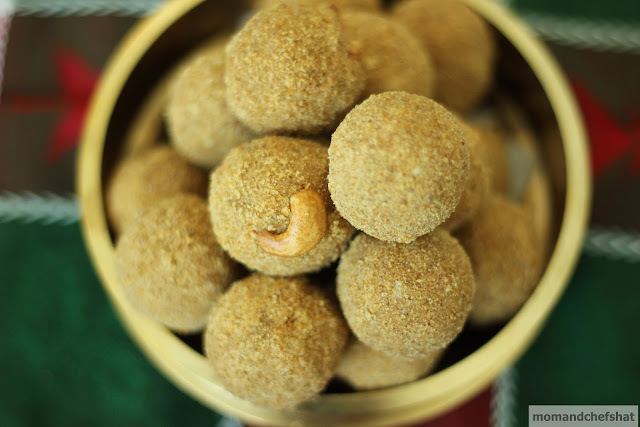 Brown coloured erissery is ready which you won't be able to resist. 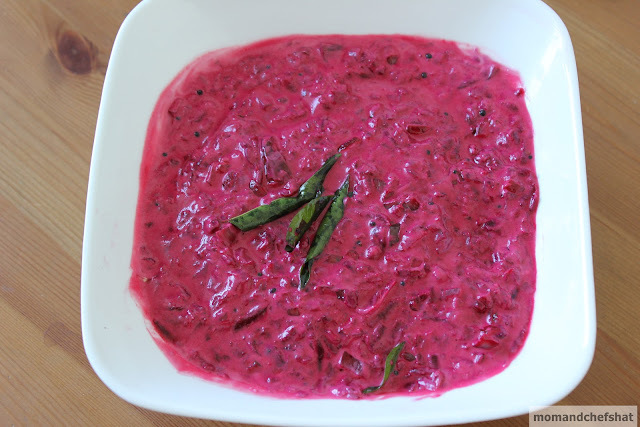 Enjoy it with piping hot Kerala rice (kuthari/rose matta) and naranga curry. Onam is such a grand affair for all Malayalis out there. Sadhya is so colourful with all its gorgeous hues and shades like yellow (pineapple pachadi), brown (puli inji), white (kani vellari kichadi) to name a few. Naranga curry is so colourful from outside, but when you chew into the morsels you get to know the bitterness. Life can be sometimes the same, sunny from outside, bitter from inside. When bitterness strikes you hard ..... What you do? You run away from life?..... Try pairing bitterness with sweetness and see for yourself. It gives life a whole new meaning. 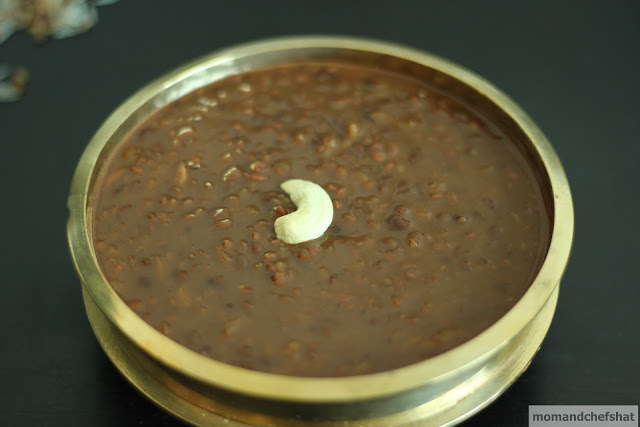 The sweetness from the head kicking Payasam can be tackled with a finger licking naranga curry. Try this .....you will love it. Ain't life worth living with all its bitterness? 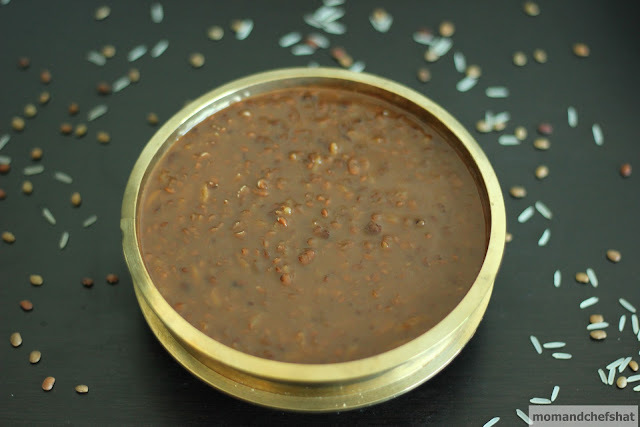 Heat oil in a thick bottomed pan, allow mustard seeds to crackle. Add dry red chillies and curry leaves. Add Naranga, green chillies, ginger, chilli powder, turmeric powder, and salt. Saute well. 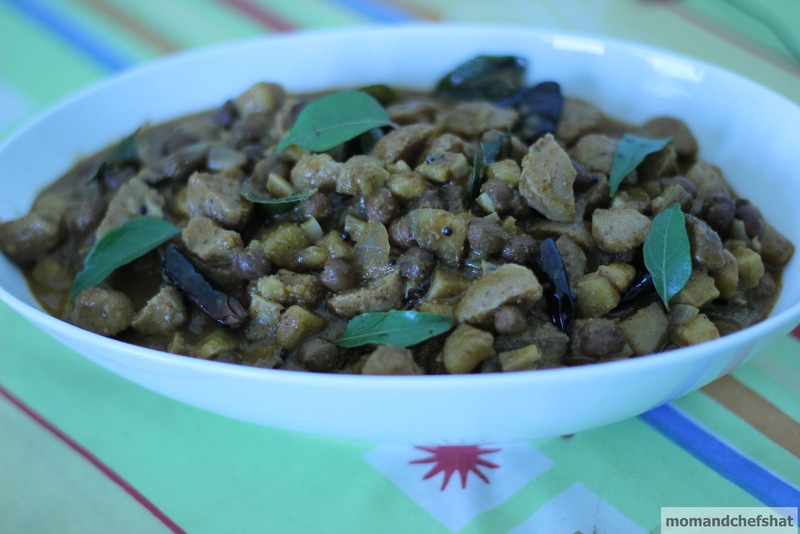 When it is sauteed well, pour in the tamarind water and allow it to boil. Add water if required. When it is done, switch off the stove. Add fenugreek powder and sesame oil and mix well. Transfer it to a pickle jar. You can serve it as it is or can be refrigerated for later use. 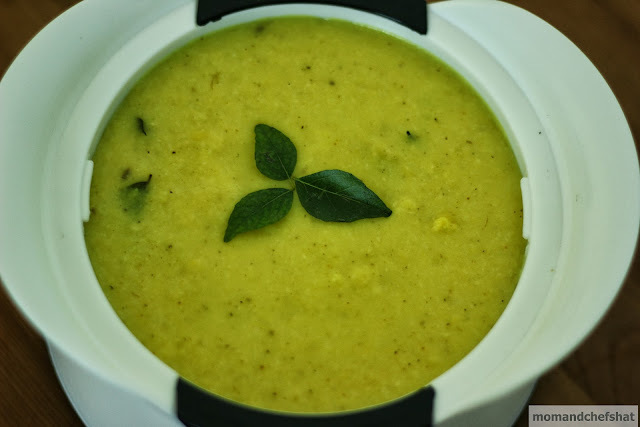 As I said in the above posts Onam Sadhya (lunch) can be sweet, tangy, spicy, bitter .... Pineapple pachadi is for people with a sweet tooth, but it is sad that it is served as a thodu curry means you get to eat very little or you have to ask for more. 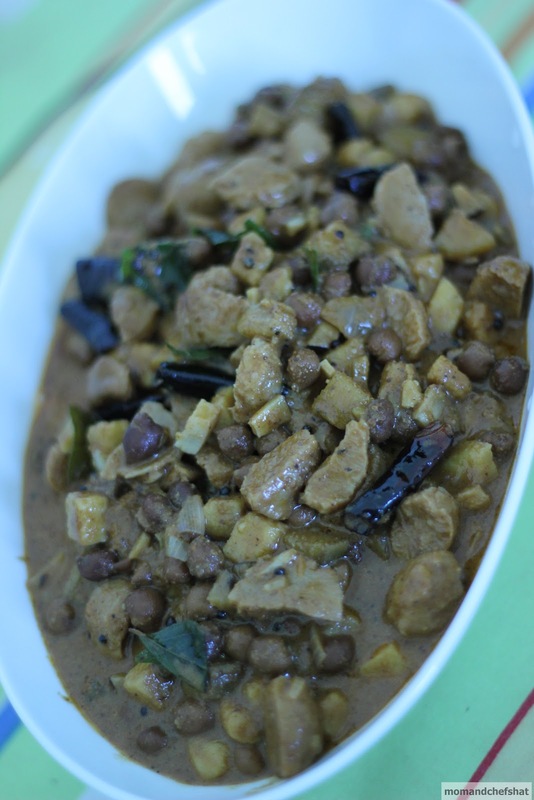 If you are not with a sweet tooth, naranga curry with all its bitterness will come for the rescue. 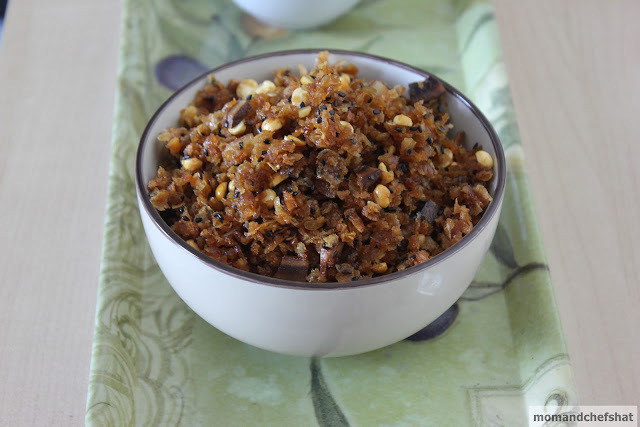 Now if you feel like having a little tanginess in your mouth, puli inji is there to balance it. In short Onam Sadhya is such a balance of flavours from sweet ....... bitterness, once a year you get to dance your tongue with all flavours oozing out. Chop ethappazham and pineapple into fine pieces. Cook them in some water along with turmeric powder, chilli powder, and salt. When the water disappears, add sugar and mix well. Add ground coconut (grind coconut very well). Soak black grapes in warm water. Remove grapes from water and let the paper towel absorb all the water contents. Add this to the above curry. Now season it with the above ingredients from (For seasoning). Pour this to the above madhura curry.